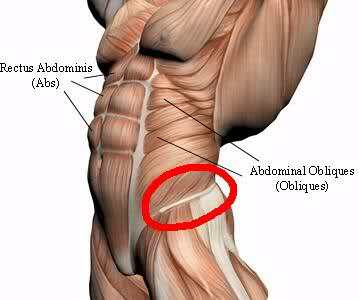 The obliques are one of the muscle groups within the abdominal muscles. Abdominal strain, including oblique muscle strain, is common among active people and athletes since the muscles are constantly engaged. Keeping them engaged allows the athlete to tighten their core and improve performance while executing skills with the entire body. If you notice oblique muscle strain, you should work to treat the symptoms as soon as possible. If left untreated, it may worsen or become chronic. Your oblique muscles are a key component of the abdomen as they let you bend sideways and twist your trunk. They also help somewhat with breathing. The top of the obliques connects with the ribs while the lower end connects with the hip bone. Everyone has both internal and external oblique muscles. External obliques are larger and on the top surface of your abdomen immediately below the subcutaneous fat and skin. Your internal obliques are underneath the external ones on either side of your trunk and this location makes them deeper. How Does Oblique Muscle Strain Happen? Oblique muscle strain can occur for a variety of reasons, but it is more likely to occur during certain activities that require the use of these muscles. Keep in mind that your obliques connect your lower back, abdominal fascia, top portion of your hip bone, and ribs. The easiest way to remember this is to think of your obliques as your waist muscles. It is possible to strain or cause pain to your obliques from forcefully and suddenly bending or twisting, a direct trauma to the abdomen, or overuse. What Does It Feel Like to Have Oblique Muscle Strain? The most important symptoms of an oblique muscle strain are pain and stiffness. The strain may lead to a sharp pain along the lower chest and side of the abdomen due to forcefully bending or twisting the trunk. This pain occurs as the muscle fibers develop microscopic tears. You may notice the pain right after you pull your muscle or the pain may appear gradual and be present even if you are resting. In the case of minor strains, it is common for the pain to only worsen when you perform certain exercises or activities. Following a strain, your oblique muscles may feel stiff and this will be more common in the morning when you wake up. It is possible that your muscles will be stiff enough to restrict your daily tasks. In cases of severe strain, you may notice bruising, weakness, or swelling of your side muscles. In some cases, your side will also feel very tender or you may notice increased pain in the abdomen or lower chest when coughing, breathing deeply, or laughing. What Can Be Done to Relieve Oblique Muscle Strain? It will typically take about six weeks to fully recover from an oblique muscle strain. Because of the long recovery time and near constant use of the muscles, you should start treatment as soon as possible. Immediately after the strain occurs, you want to follow R-I-C and provide rest, ice, and compression. This method will help to reduce damage and bleeding within your muscle tissue. Rest is crucial for treatment. You will want to avoid all activities, particularly those that involve sports and otherwise aggravate the pain. You should avoid these activities for several weeks as they may interfere with healing. Ice your injury to prevent inflammation and pain by limited blood flow to the affected area. Remember that you should never apply ice directly on your skin as it can damage the tissue. Crushed ice will do a better job at molding to your body’s contours. Try to apply the ice for 15 to 20 minutes and wait at least an hour before repeating. Apply a compression bandage by wrapping your abdominal muscles in an elastic bandage designed for this. It will provide extra protection and support while you heal. You will want to avoid applying heat for the first 72 hours after you strain your oblique muscle as this will slow down the process of healing. After three days have passed, use warm compresses to increase blood and nutrient flow. Don’t apply the heat directly to the skin; doing so may lead to burns. The ideal is to wrap a heating pad or hot water bottle in a blanket or towel. Apply the compress 15 to 20 minutes and wait at least an hour before repeating. A deep tissue sports massage can help you heal after the acute stage is done. You can apply cross friction massage on the tendon at the spot it attaches to your bone as it can help realign the new collagen fibers while preventing sticky bits in your forming tendon. Other types of massage can improve the blood flow and relax any tight muscles. Before trying any of the following exercises to treat your oblique muscle strain, consult with your doctor to avoid doing further damage. Stretch: Always pay attention to your body’s responses to the stretches and don’t stretch if it is painful. Stand keeping your feet slightly apart. Lift the arm on the side of your body with the injury and gently bend your body in the opposite direction until you feel a stretch. Hold for 30 seconds and go back to the starting position. Plank: Get in a push-up position keeping your hands right under the shoulders, your gluteal muscles squeezed, the feet hip-distance apart, and the neck and spine level straight. Hold the position 20 seconds. Side plank: Lie down on the injured side and bend your knees. Lift your body up with your forearm from the injured side and knees. Once you are resting on the forearm, hold for 20 seconds. Upward-facing dog: Lie face down with your legs extended and together. Put your hands parallel to your shoulder on the floor. Push the upper body up and arch your back so your legs stay on the mat. Hold for 10 to 30 seconds. In some cases, your doctor may suggest NSAIDs (non-steroidal anti-inflammatory drugs) to reduce swelling and pain. Examples include ibuprofen and aspirin. Always warm up and stretch your injury before exercising. Try to do side flexion exercises and trunk rotations.